I have been away from this blog for a week because I was at a conference in Miami for work. I know, poor me. I had to go to Miami. But believe it or not, I had a good time anyway and made it back to Connecticut just in time for another record snow fall. I was happy to be home in time for the snow and not stuck in the airport. I really do like the snow. We have had a bit this year in the northeast. Breaking records all over, including several closed school days. My son is happy with that part. It is a glorious weekend and I am looking forward to spending time with my good friend and her son making waffles today. The boys will be out back using the snowball launcher and we will break in Jackie’s new waffle maker an my new whipped cream dispenser. It will probably end up being lunch or even an early dinner… but it is the weekend and I am of the mind-set where anything goes on the weekends. Especially when having fun. I thought I would share ideas to spruce up those fluffy delights and ways to bring the kids in on the fun too. Any of the below can be used on pancakes or french toast if you don’t have a waffle maker. The batter. To be honest, while making the batter for waffles really is not difficult, I still use the boxed mix where you just add water. Its good and quick, so why not take advantage of this short cut and follow the directions on the box. I do and that allows me to spend a little more time on making the delicious toppings. After all, isn’t that the real reason we eat pancakes and waffles, for the toppings? Fresh or Frozen? When it comes to adding ingredients to the batter or making a nice fruity syrup, what is better – fresh fruit or frozen. I use frozen fruit for most applications. It is more economical and works better for making the syrup. You can use either fresh or frozen when adding fruit to the batter. However, fresh fruit is best if using as a topping whole or sliced. The exception to this is canned fruit. Drain the juice and the fruit can be used in any way you wish. Ingredients that can be mixed in the batter or as toppings. For use in the batter, make sure they are cut into a medium or small dice so the batter is not too lumpy and will cook evenly. For use on top, slice them nicely and fan out on top of the waffles. Some of the items I mentioned above may make you question my motives. Waffles can be made sweet or savory. Breakfast, lunch or dinner. Use waffles instead of bread when making a toasted sandwich. Adding chopped sausage, bacon or ham makes this meal a little more substantial and still works very well with maple syrup. Instead of having the meat as a side dish – add it into the dish. Heat over med-high heat to start. Bring to a boil and reduce heat to med and continue to simmer. Continue to simmer until you can dip a metal spoon into the mixture and the syrup clings to the spoon. It should resemble maple syrup in thickness. Depending on what you want to do – you can strain the sauce to have a nice smooth sauce, put all in a food processor and process or serve lumpy. It all depends on how you want to present it. When using a strainer, use a “fine mesh” strainer. It has tiny hole as to catch the seeds when straining. You may need to stir the mixture in the strainer while straining as sometimes the skin and seeds will block the syrup from passing through. Also use the back of the spoon to press out all the goodness. This is a great touch on the side, or diced and sprinkled on top or mixed in the batter. The candied method makes it a sweet compliment. Cooking the bacon in the oven (candied or not) is an easy and cleaner way to cook bacon. You don’t have the splatter and you can do almost the full pound in one shot, vs several batches on the stove top. The equipment you will need is a baking sheet with a cooling rack on top. This will prevent the bacon sitting in the grease. It will drip below into the pan, and then you can save the grease for future use or let solidify before throwing out. Saving for later in the fridge makes for a delicious flavor enhancer in lieu of oil or butter. Line the baking sheet with tin foil. Optional: Add in 1 tsp of cayenne pepper and mix with the sugar. This will give a little kick and still yummy. The first step in making whipped cream – chill the bowl and whip attachments before starting. Start to mix on low and gradually increase to high-speed. If you start out on high right away, your kitchen walls will enjoy the mixture, but your waffles won’t. Beat until you can form stiff peaks. If you put a spoon in and pull up – the cream should not sink back into the mixture. It would just stay up. That’s it – you are done. You can spoon on, or pipe on to the stack. For an easy simple piping, spoon the whipped cream into a zip lock bag, and snip a little off the corner. You can always snip off more if you want a thicker line, but start small. Then slowly press through the bag and make a design on the stack that you wish. If you want more fancy, you can use frosting tips if you have them. Blueberry: Using frozen blueberries, make a blueberry syrup and strain it. 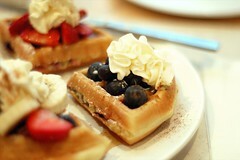 Add fresh blueberries to the batter and cook according to the instructions for the waffle iron or mix/recipe. Top the waffles with maple syrup, whipped cream, then drizzle with the blueberry syrup. This same method can be used for any berries. Banana Nut: take about 1 cup walnuts chopped (or macadamia, pecan, or hazelnut), and toasted on the stove over med heat for about 2 – 3 minutes. Stir and toss to prevent burning. You want them a nice golden brown. Slice the bananas. Make the waffles according to directions. Top with the bananas, maple syrup, maple syrup whipped cream and sprinkle with the nuts. Candied bacon will work well with this as well. Olive & Feta: 1/2 cup diced olives (kalamata olives, spanish olive, or greek mixture, pitted), 2 cups batter. Mix together and make according to batter/waffle iron directions. Crumble 1 cup of feta cheese, 1/2 cup sliced olives, 1/2 cup diced tomatoes (seeded), 1 TBS fresh Thyme, diced. It is best to have warm waffles, top with the feta cheese, olives, tomatoes and top with a sprinkle of thyme. The warm waffle will help to melt the cheese creating a nice creamy bite full of flavor. You can mix the tomatoes, olives, feta and thyme together ahead to make a “salad”. It is important to seed the tomatoes for this to prevent the waffle from becoming soggy. To quickly seed a tomato: Cut off the top part of the tomato and squeeze out the juice and seeds. Or take a small teaspoon, and scrape out the inside. The seeds and juice can be saved for up to a day in the fridge and used in sauces or salsas. Spicy: Cook 2 spicy sausage links. When done, dice the sausage into small bits. Add 1 cup of sausage to 3 cups of batter with 1/2 tsp of cayenne pepper. Cook the waffles according to directions of the batter recipe or waffle iron. Top with maple syrup, any remaining sausage bits and some caramelized onions tossed with balsamic vinegar if you wish. Peanut butter and Jelly: Add 1/2 cup melted peanut butter to 2 cups batter. Cook the waffles according to directions. Melt about 1 cup of jelly in a sauce pan over med heat. Add 1 – 2 TBS maple syrup. You may need to add a little water to thin it out (start with 1 TBS). Let simmer for a few minutes until it coats your spoon. Then it is ready to use as a topping. You can add bananas and whipped cream or even marshmallow fluff as toppings. These are just a few ways to turn your waffle breakfast into a full meal any time of day. Bringing kids into the kitchen with experimenting can make this a fun weekend day in the kitchen. And kids have great creative ideas. Posted by culinaryease on January 30, 2011 in Cooking for two or less, General Cooking, Recipes, Vegan/Vegetarian and tagged Brunch, Waffles, Whipped cream. Ok, I’m ready to try the greek olive and feta waffles… cucumber/yogurt/dill sauce anyone? I know, I can never spell tazdiki or even come close enough for spellcheck to know what I mean. You just totally inspired me to make waffles for dinner in the next week or so. I know we would all LOVE this as a treat! Thanks for the inspiration and recipes! !